Sorry I’m so bad at this. Also, steak. Sorry it’s been so long. I have been adjusting back to the working grind, and while it has already been 3 months, I have not been doing a great job of keeping up with this. I do have several posts saved up, so I have been thinking about blogging but not actually do it. Here’s a quick update, with a promise for more! The other night we made a simple but delicious meal. We grilled a very thick steak to medium rare, and made a mushroom wine sauce to go over it. We crumbled some blue cheese over the top and it was absolutely delicious. I made mashed potatoes the way I usually do, with some potatoes, milk, butter and salt to taste, and then for an added deliciousness, I added garlic and goat cheese! Goat cheese in mashed potatoes adds an extra rich creaminess and I love it. We cooked some baby carrots in butter and brown sugar and that was all there was to it! 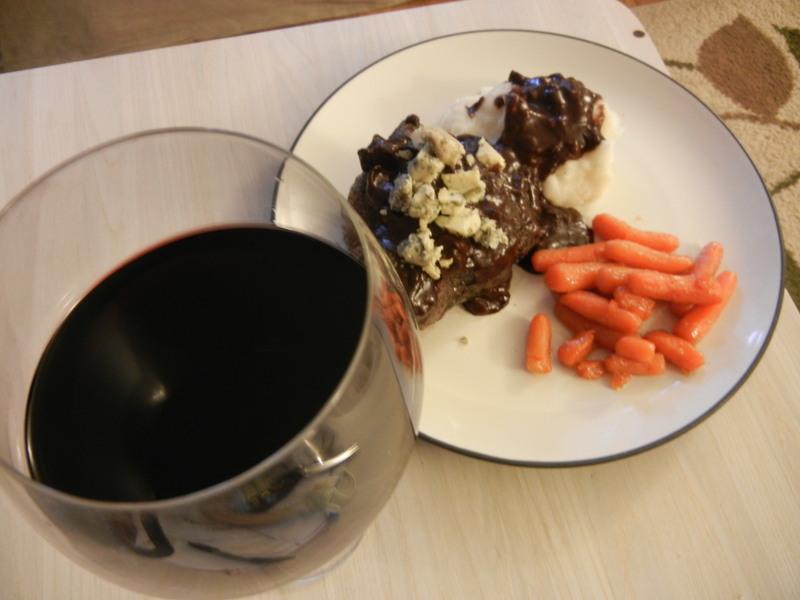 Paired with a delicious dry red wine, and we had a quick and delicious meal. The mushroom sauce recipe was actually from a mushroom cookbook we bought at the St. Louis Arch. 1 tsp. cooking wine (I used the wine we planned to drink and put in more than a tsp. Saute mushrooms in butter. Remove mushrooms. Blend flour into pan, then stir in remaining ingredients and let come to a boil. Return mushrooms to the sauce and serve. I am going to try to get a couple more saved posts up this week!